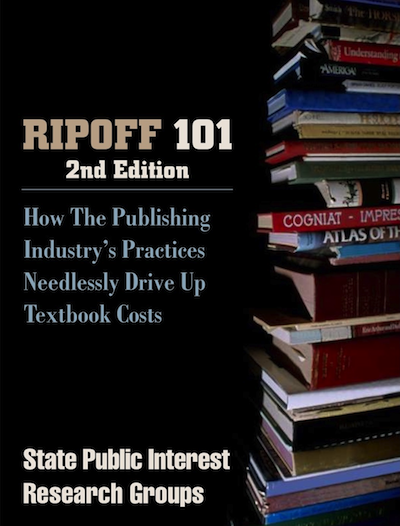 In January 2004, the State Public Interest Research Groups (PIRGs) released Ripoff 101, a report documenting the high price of college textbooks. Ripoff 101 surveyed popular textbooks at 10 public colleges and universities on the West Coast and detailed the gimmicks publishers use to artificially inflate the cost of textbooks. The report sparked extensive media coverage, a call to action from hundreds of faculty members around the country, a congressional investigation, and government action in a number of states, including California, Connecticut and Illinois. In order to both confirm our initial findings and to follow up on a number of anecdotal reports of additional problems with textbook pricing, the State PIRGs conducted an expanded survey of the most widely purchased textbooks at 59 colleges and universities across the country. The 2005 survey also looked at a number of industry practices not featured in the 2004 report. Overall, the expanded survey uncovered more evidence that textbook prices are a significant part of college costs, that textbook prices are rising at a fast pace, and that publishers use a variety of tactics to inflate the cost of textbooks. In addition, we found that textbook publishers increase textbook prices faster than the rate of inflation between editions and charge American students more for the same books than students in other countries. As higher education costs continue to skyrocket for American students and families, the price of college textbooks represents a serious part of the affordability equation. The average student will spend nearly $900 each year purchasing textbooks,nearly half of the tuition and fees of two-year public colleges and a fifth of the amount that in-state students would pay for tuition and fees at four-year public colleges this year. Textbook prices are increasing at a fast rate. Textbook prices are increasing at more than four times the inflation rate for all finished goods, according to the Bureau of Labor Statistics Producer Price Index. The wholesale prices charged by textbook publishers have jumped 62 percent since 1994, while prices charged for all finished goods increased only 14 percent. Similarly, the prices charged by publishers for general books increased just 19 percent during the same time period. New textbook editions are costly and limit the availability of used textbooks. The most widely purchased textbooks on college campuses have new editions published every three years, on average. New editions of the textbooks surveyed cost, on average, 45 percent more than used copies of the previous edition. When issuing new editions, most publishers raise the prices of their books. Of the textbooks surveyed, new textbook prices jumped 12 percent on average between the previous and current edition, almost twice the rate of inflation between 2000 and 2003 (6.8 percent). Three-fourths (76 percent) of the faculty surveyed in our 2004 report said that they found new editions justified only “half the time” or less. Bundling drives up textbook costs. Half (50 percent) of the textbooks in the survey were sold “bundled,” or shrinkwrapped with additional instructional materials such as CD-ROMs and workbooks. When a bundled book is available for purchase unbundled (without the addon materials), the bundled book is, on average, 10 percent more expensive than its unbundled counterpart. Some bundled textbooks are substantially more expensive. For example, a Thomson Learning chemistry textbook was 47 percent more expensive bundled ($223.75) than when sold as a separate textbook ($152.00). More than half of the bundled textbooks surveyed (55 percent) were not available for students to purchase a la carte, in which the textbook is available without the add-on materials. Two-thirds (65 percent) of the faculty surveyed in our 2004 report said that they used bundled items “rarely” or “never”. Textbook publishers charge American students more than students overseas for the same textbooks. The average textbook surveyed costs 20 percent more in the United States than it does in the United Kingdom. Some textbooks were dramatically more expensive in the United States than in the United Kingdom. For example, Pearson’s Calculus textbook, selling for about $100 in the U.S., costs only $38 on the U.K. Amazon.com website, just one-third the price. Freeman’s Chemical Principles textbook, priced at $185 in the U.S., is available in the U.K. for only $88—half the price. Some publishers display overseas prices on their websites. For example, Thomson Learning’s website lists the prices charged to students in the U.S., U.K., Europe, Africa, and the Middle East. According to this website, for the books included in our survey, Thomson Learning charges U.S. students 72 percent more, on average, than it does students in the U.K., Africa and Middle East. Some books are priced even higher. For example, Thomson Learning charges U.S. students $108 for its Biology textbook, but charges students in the U.K., Africa, and Middle East only $51 for the same book. Provide faculty with more information on the company’s textbook materials, prices, intended length of time on the market and substantive content differences from previous editions. In the past year, students, faculty and a number of state legislatures have asked the publishing industry to adopt these recommendations formally into their business practices. To date, the publishing industry has refused to do so. In addition, we recommend that faculty use their decision-making power to demand substance over bells and whistles and consider cost and the viability and accessibility of previous editions secondary only to educational value when selecting books for their courses. Finally, students and universities should help make used books available by sponsoring on-campus and online bookswaps, campus rental programs and other means.